Q: Tell us a bit about What I Love About You, Mom — what prompted you to write the book and what went into its design and contents? When David’s mom had a special birthday a few years ago, we wanted to give her a memorable gift. She had no material needs; like many moms, all she really wanted was love and appreciation from her children. We decided to adapt an earlier journal that we’d published for couples – What I Love About You – for her. All four of her adult children filled it with memories and thanks, and presented it to her on her special day. She was floored. To this day, she says it’s the best gift she’s ever gotten from her children. We decided to create a version of this journal for others to do this for their moms, too. What I Love About You, Mom is a little fill-in-the-blank journal that helps you tell your mother the many things you love, admire and appreciate about her. We provide the prompts, and you fill it with memories and love. It lets you share memories from the early years; express admiration for your mom’s special qualities and talents; say thank you for the many things she’s done for you over the years; and express good wishes for the future. It’s not always easy to say what’s in our hearts, so the journal leads you through this in different ways: writing prompts with a few lines to answer, lists to checkmark or circle, spaces for photos or drawings, fun things like a template for a gift certificate, a place to trace the outline of your hand like we all did as kids…lots of different ways to express thanks and memories. Some of the prompts are more playful (I love this funny family sorry about the time you…) and some are more reflective (You are strong or unique in this way…). Q: What are readers saying about their experience of using this book? What I Love About You, Mom has only been out a few weeks, so we are just now hearing from people who have started writing in it. They’re saying that they can’t wait to see the look on their moms’ faces when they give it to them. They like making a one-of-a-kind gift like this for their mom. Some have said that the journal is giving them a deeper appreciation for how important their mom has been to them over the years. We expect similar responses to this book as the ones we’ve gotten over the years from people using the couples’ version – What I Love About You. They share that it does take some time to write in the journal (at least a few sittings), but that the pleasure that it gave their loved one, many shedding tears of joy, made it a wonderful experience. We hear about how close it made them feel to each other. Q: What’s your favorite section of or activity in the book? David and I worked hard to include a mix of topics and activities so that everyone—all kinds of personalities and preferences—will find things that engage them and are comfortable to them. I liked doing the more creative pages. Even though I’m not an artist, it felt right that a child-to-mother gift include a little drawing. One page in the journal asks you to pick one word that describes your mom and illustrate it. I picked “determined.” My mom is a great role model to me for aging well—she works hard at staying mentally and physically fit. She had a stroke a few years ago, but immediately started re-training and very soon was back to her farm work and hiking the hills. I drew “D-E-T-E-R-M-I-N-E-D,” with each letter climbing up a hill. The final “D” was on the top of the hill, wearing sunglasses and a carrying a walking stick. I also liked writing about things I look forward to in our relationship; things I want her to a part of in my life and that I hope we can do together, both big (celebrating future weddings and great/grandchildren) and small (tea time, watching our favorite shows, going on walks). Q: Have you filled out the book and gifted it to your own mothers? What was their reaction? David’s mom is still thrilled with her copy, years later. She has it on her coffee table for all her friends to see. She says she wishes she’d thought to do something like this for her own mother before she passed. I filled it out for my mom as soon as we got the published edition earlier this year. We live on opposite sides of the country and don’t get to see each other often, so this was a nice way to stay close. She’s in her early 80’s now, and doing really well, but you never know what could happen, so I am immensely grateful to have been able to fully express my appreciation to her now. She loved it. She especially loved hearing my memories of our early days, which triggered memories of her own. As a result, we had fun exchanging stories, including a funny story she told me about a trip to the pediatrician when I was a girl that I had never heard before. Q: How will children — including adult children — benefit from enjoying and sharing this book? Performing acts of love feels good. In our experience, expressing love and gratitude like this is at least as beneficial to the giver as it is to the receiver. One person told us that the memories the journal extracted from his mind were as pleasurable to him as he expected they will be to his mom. In addition to the pleasure of recalling happy times, writing about the relationship, focusing on the positive blessings, makes you feel more connected and even more loving to the person. If the journal brings you closer together, that’s truly a gift to you both. David and I feel more at peace knowing that our moms have heard what’s in our hearts. Saying “I love you” is great, but there is something powerful about giving something that can be read and re-read many times over. Now we can be sure that our moms know how much we love them back. 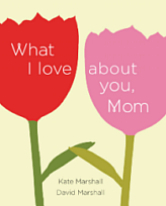 This entry was posted in Family Stories, Mom, Relationships, What I Love About You Mom on May 2, 2013 by Marshall Books. John Izzo, PhD, author of The Five Secrets You Must Discover Before You Die, claims that the secret to a happy marriage is sincere, loving affirmations. He sites a study that claims that couples who express seven positive affirmations for every one negative criticism of each other have longer lasting marriages than those who do not. Do you agree? Of course, staying loving and positive is not always easy to do. Sometimes we lose it – nobody’s perfect. But when one of us is mindful enough to change the channel and sing each other’s praises it feels indescribably good. That’s what our two couples’ journals – The Book of Us: A Journal of Your Love Story in 150 Questions and What I Love About You – are all about. The writing prompts and fill-in-the-blank format help you find the words to affirm your partner in a way that can be read over and over. Post-Valentine’s Day reviews – from people who got or gave one of our couples journals for VDay – are popping up on Amazon now. These reviews convince me that we’re on the right track with these journals. It makes me happy that they’re making a difference in people’s relationships. 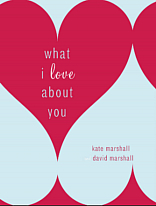 This entry was posted in Relationships, The Book of Us, What I Love About You on February 19, 2013 by Marshall Books.